Baroda’s connection with Bharatanatyam begun in 1883, when the then Maharaja Sayajirao Gaekwad III of Baroda, married a beautiful princess of Tanjore called Chimnabai (Laxmibai of Tanjore). The queen Chimnabai who was knowledgeable in Bharatnatyam and Carnatic Music, brought this Music and Art group from Tanjore to Baroda, as part of her dowry. In this troupe were two dancers – Gaura (also known as Gowriammal), whose mother was Kammu Amma, a Tanjore court dancer, and Bhanumathi, a devadasi from Kumbakonam. Two nattuvanars, Vadivelu and Sabhapati – a pair of father and son, accompanied the dancers. Gaura stayed on but Bhanumati returned to Kumbakonam and another dancer Kanthimati came as her replacement. Gaura was a fine dancer and composer. She came to Baroda when still young (12 years old) and lived in a three-storeyed mansion with other palace entertainers. A buggy coach would come to take them for practice. Gaura was a very religious and generous person and sponsored meals for 50-60 persons daily. Gaura earned Rs.112 as a monthly salary. She had three sons and a daughter. Her sons trained as nattuvanars and eventually accompanied her. She taught Bharatanatyam to her daughter Chandra amma, who also later danced in the Lukhsmi Villas Palace till her marriage. Chandra was educated and could speak nine languages! One of Gaura’s sons Tulasidas also learnt Bharatanatyam from her. Gaura was a court dancer for 32 years, whereas Kanthimati (the replacement dancer of Bhanumati) danced for 35 years. Two other palace dancers, Saraswati (who lived in Mumbai) and Ratnamala (who lived in Baroda) also learnt Bharatanatyam from Gaura. Gaura’s day began with good breakfast, milk with egg, and badam halwa to build stamina. Dancers used to performed mostly at Motibaug and Nazarbaug Palaces, although they practiced daily at Indumati palace. Every Wednesday they danced at Indumati Palace and when the Maharaja asked for us, we danced at Motibaugh too, says Ratnamala. attendance, the yearbook of dance, issued a Gujarat Special Edition in 2002. This issue/book remains the only authentic overview and first hand compilation of history of dance in Baroda (and Gujarat) till date. Unlike the mix and fix, match and latch (to other languages) that came to dilute the form, these dancers presented only traditional margam, no deviation, not even to please the kings! They never composed anything in Marathi or Gujarati to curry favour. There were a few Kathak dancers at the palace too such as Gaurabala, who came from Mumbai, Chamoo and Sharda. Singers Mirabai and Haridham too stayed at the palace. Gaura amma died in 1940 (by other account in 1941). Kanthimati died in 1953. Chandra amma, Gaura’s daughter died in 1983. By then Bharatanatyam had not only established itself, but entrenched itself in all of India. Gauri had a wish that people remember her for the contribution of her in field of Bharatnatyam. For that Maharaja Pratapsinh Gaekwad made a statue (seen in header image) of Gauri, which can be seen at Maharaja Fatesinh Museum. 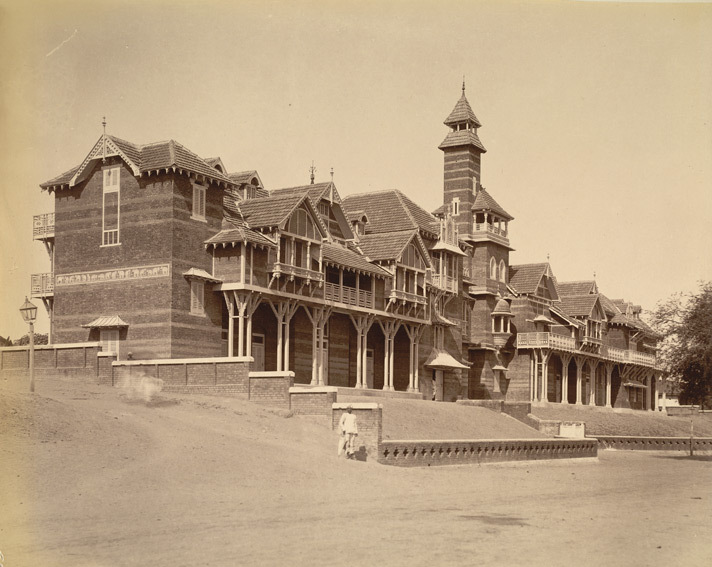 When Baroda became part of India upon independence, the royalty gifted many buildings to be used as various faculties and departments to become India’s first university – the Maharaja Sayajirao University (MSU), initiated in 1949-50 to teach performing and fine arts at graduate level. Below is a rare video that contains footage of “Bharatanatyam” performed by Gaura and Kanthimati .The video was likely filmed at the 1926 Golden Jubilee celebrating 50 years of Maharaja Sayajirao Gaekwad III’s reign, and the locations featured are the arena/agad, Motibaug Palace gardens, Nazarbaug Palace gardens, and Nyay Mandir !